Sadly, many of the historic buildings in Coalwood and surrounding areas have already been demolished: the Big Store, the Clubhouse, Big Creek High School. More will probably follow. The memories of Coalwood are still very much alive for many people, but unless you used to live there, there's not much left to give a visitor any idea of what the town used to be like. Sad News: The Big Store in Coalwood was torn down on March 29, 2008, by the owners of the historic Coalwood properties, Alawest. We'll go on a brief tour of Coalwood. 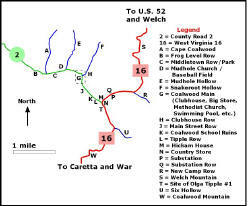 We start on the south as we come in on West Virginia 16 from War and Caretta. We then move down Tipple Row, past the Coalwood School, down Main Street Row, into Coalwood Main, past Rev. Richard's Church and then to Cape Coalwood. Click on this map to enlarge and print. 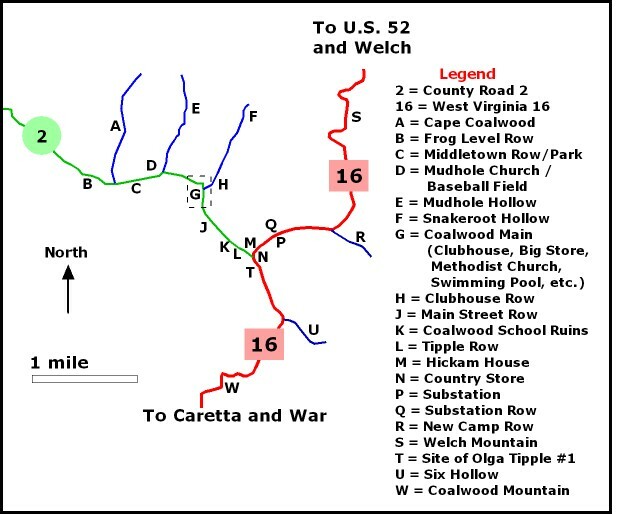 The map shows the major sites in Coalwood. This is a typical two-family (duplex) house. The rectangular shape of the chimneys and the slate roofs are typical of the company homes in Coalwood. When the company sold the homes, many families bought both sides of the duplex and cut a door between the two halves. Interestingly, the only bathroom in each side of the house is on the second floor. We are standing in the parking lot of the Country Corner. Across the street was the site of Olga Coal Company Tipple #1. Railroad tracks (coming in from the right and going to the tipple) used to run parallel to the road. There are a few tiny, abandoned buildings left on the tipple site, but most everything was torn down years ago. The road is WV 16. To the left, it crosses Coalwood Mountain heading for Caretta and War. To the right, a different road (McDowell County Road 2) leads into Coalwood Main. WV 16 turns at a right angle at this point and heads for Welch (directly behind where we are standing.) According to Coalwood historian David Goad, the tipple in Coalwood was torn down in 1959, and the Norfolk & Western Railroad began removing the tracks leading to the tipple in the same year. This is a sign we found on the ground at the site of Olga Tipple #1. This is the Country Corner. It is a small gas station and grocery store. The Country Corner is the only businesses still operating in Coalwood today. Years ago, there used to be a Texaco station on the same corner where the Country Corner is today. 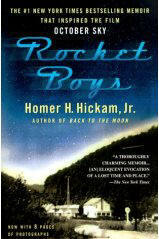 If you have a copy of this paperback edition of Rocket Boys, you can see the Texaco sign on one corner and the Hickam house on the other. This sign is next to the Olga #1 Tipple site, across the road from the Country Corner. This is the Hickam House. The Country Corner is across the street to the right. Olga Tipple #1 was behind us to the right. Coalwood Main is down the road to the left. According to Barbara Hilemon's book, Homer Hickam Jr.'s bedroom was on the second floor on the right side of the brick chimney. This is the back of the Hickam House. Another shot of the back of the Hickam House. Looking towards Coalwood Main from the back of the Hickam House. There is a small road to our right that was used to deliver coal and other items to the row of houses. We are standing in the backyard of the Hickam House looking down Substation Row going towards Welch. The brick building on the right is the power company substation. During the 1950s and 1960s, Coalwood School was where grades 1 through 9 were taught. Of course, you have read about the Great Six who were teachers in grades one through six here! The school is no longer used and has suffered almost total destruction from fire and vandalism over the years. Above Left: we are standing on the side of the road between the Country Corner and Coalwood Main. Where we are standing is where the Norfolk & Western railroad lines ran down to the Olga #1 tipple. (The tipple would have been to our left.) During this time, there was a steel bridge that the students used to safely cross the road and the railroad tracks. The bridge would have been directly above where we are standing. There was also a road on the far side of the school that ran down to the general area of the tipple. This road was only for the adults to use. Here is the floor plan for Coalwood Junior. First Floor: Gym, showers, dressing rooms, boiler room. Second Floor: Classrooms for grades 1-6, principal's office. Third Floor: Classrooms for grades 7-9, library, film room, cafeteria. Many of the homes along this road were torn down after the major flood in May 2, 2002. General Superintendent's House. "The only mansion in Coalwood." The Club House [no longer standing] and the Coalwood Community United Methodist Church. Snakeroot Hollow is between them. Looking down Snakeroot Hollow. The Coalwood Community United Methodist Church is on the left. The Club House was on the right. Coalwood Community United Methodist Church. This church was originally built by the coal company and has been various denominations over the decades. Today it is a Methodist church. The church is sometimes called the "Coalwood Community Church." Coalwood Community United Methodist Church. The Dantzler House and the Coalwood Community United Methodist Church. Post Office. The original post office was on the lot where we are standing. The Club House was behind us to our right. The building across the street has been torn down. Company Store. The "Big Store." (In earlier days, there was a smaller store between the Country Store and Six.) These buildings have been torn down. Sadly, the some of the apartments were demolished in October, 2017. Sign in front of the company apartments. Machine Shop buildings. Note: the N&W railroad tracks would have been approximately where we are standing. Ahead of us, about a mile away, the tracks would have ended at Olga Tipple #1. Interior of one of the machine shop buildings. A different angle of the interior. Coalwood Swimming Pool. The Olga office building is directly behind us. Company apartments are straight ahead. Machine Shop buildings are to our left. The Methodist Church is to our right. After the Community Center building was torn down, the people of Coalwood applied concrete to the floor and walls of the basement and turned them into the swimming pool you see above! The Coalwood VFD fire station. The Coalwood Little League Baseball Park at the turnoff for Mudhole Branch. of course, Reverend Richard's Church. A model of a space shuttle, donated by NASA, stands in the park. The Hatmaker House. If you have read The Coalwood Misfits, you'll remember the story of the day Clear Fork Creek flooded and got into the Hatmaker's house. We are standing in the park where the Space Shuttle is. Clear Fork Creek is directly behind us. When the flood occurred, the waters were well inside the first floor of the house. Sign on Flog Level Row pointing towards Cape Coalwood. The road to Cape Coalwood. A reproduction of the blockhouse at Cape Coalwood. This is what's left of the slate dump where the Rocket Boys shot off their rockets. Years ago, most of the slate was removed, and the forest is taking over the site. This was Cape Coalwood. David Goad's site. Contains interesting historical photos of Coalwood. Apple Computer's web site about Coalwood. Compiled during the Second October Sky Festival.